The Air Jordan 8 Retro has been on the limelight for the past few years, but it is expected to turn heads this year. 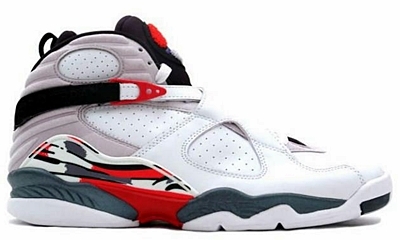 Aside from the “Playoffs” and “Aqua” edition that we have recently previewed, the Air Jordan 8 Retro is also slated for release in White / Black-True Red colorway this year. The shoe sports a white upper part with grey shade at the back and accented with black and red hints. This edition of the shoe was last released in 2008 as part of Jordan Brand’s Air Jordan Countdown Pack that year. Jordans Out will update you once more information about the return of this kick is released.